In this spy drama series, a team of high-tech experts work to stop high-tech threats to national security. Each member of the team as an area of expertise, including psychology, engineering and coding, and they must bring their skills together to solve difficult cases. On Christmas Eve, when Walter chooses work over spending quality time with his friends, he falls down the stairs and hits his head. As he lays unconscious, he enters a dream world where Team Scorpion never existed and he meets his guardian angel. For Sylvester's birthday, Team Scorpion visits a renaissance festival, but the revelry is cut short when a group tries to rob a nearby police evidence locker. Also, Paige grows weary of Walter's play-by-play of all the historical inaccuracies at the festival. When poachers almost kill a pregnant endangered deer, Team Scorpion recreates the animal's womb to try to save it and its baby's life. Also, Happy and Toby discuss the future of their family. Team Scorpion continues to work with their nemesis, Mark Collins, in order to prevent an extinction event that could end humanity. Also, Cabe's last-minute decision while on the case leads to the possible end of his career. 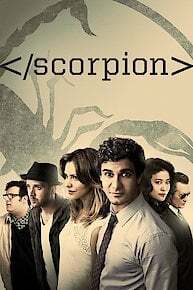 Scorpion is currently available to watch and stream on CBS. You can also buy, rent Scorpion on demand at CBS, Amazon Prime, Amazon, Vudu, FandangoNow, Google Play, iTunes online.